While attending The Voice Karaoke for Charity in Hollywood on Thursday, April 21, Christina Aguilera paid tribute to her own little star. 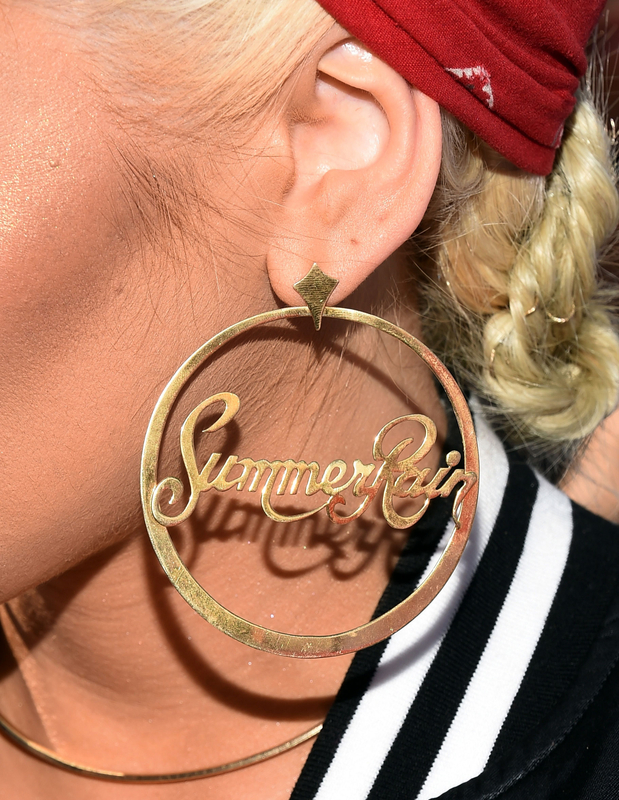 Her huge &apos;80s-style hoop earrings read “Summer Rain” — the name of her 20-month-old daughter with fiancé Matt Rutler — in cursive. The Voice judge and “Your Body” songstress displayed her danglers by sweeping her blonde locks up in a red bandanna that matched her signature red lipstick, as well as the lettering on her silk David Bowie 1974 tour bomber. The hot mama, who also shares son Max with ex-husband Jordan Bratman, tucked a simple white crew-neck tank, topped off with a gold choker, into a pencil skirt that fell just below her knees, showing off her peep-toe stilettos. Aguilera doesn’t just take her fierce accessories to the job, though. In March, she opened up her bag for Us Weekly to reveal her essentials … like perfume, tea bags, throat sprays and crystals “to keep [her] Zen and calm,” she said. PHOTOS: Before They Were on 'The Voice'!